Over 100 beef producers attended the 25th annual meeting of the Harrison County Beef Cattle Association on Monday night, Nov. 9 at the Harrison County Extension Office. Following a meal, the group held their regular business meeting. It happened a little later then usual this year: the attack of the lady beetles. Just this week dozens of people have asked, “What do I do about all the lady bugs trying to get in my house.” Well, the short answer is seal up the house well and get out the vacuum cleaner. 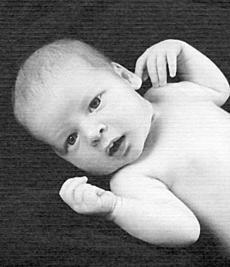 Hunter Matthew Jones was born to LaChanda Patrick and Matthew Jones of Cynthiana on Nov. 2, 2009 at Harrison Memorial Hospital. He weighed 5 lbs. 14 oz. 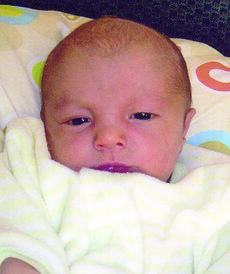 Elijah Daniel Switzer was born to Eli and Susan Switzer of Cynthiana on Nov. 10, 2009 at Harrison Memorial Hospital. He weighed 7 lbs. 1 oz. Births announced this week are: Anna Marguerite Dahmer, Oct. 21, daughter of Marilyn June Welte and Stephen Paul Dahmer; Matthew Fritz McCarty, Oct. 28, son of Charles Nicholas and Leslie Fritz McCarty; Cheyenne Noelle Cook, Oct. 18, daughter of Tim and Nancy Cook; Jacob Robert House, Oct. 10, son of Robert and Margaret Leverette House. The Harrison County High School Marching Breds take second state title in Bowling Green. Their performance them was Festival of the Royals (it’s a changing of the guard). 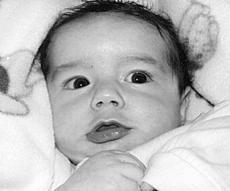 Justin Wayne Tolliver was born to Justin and Nikki Tolliver on Aug. 11, 2009 at Harrison Memorial Hospital. He weighed 7 lbs. The USDA Natural Resources Conservation Service (NRCS) administers the Environmental Quality Incentives Program (EQIP), a federal program that provides technical and financial (cost-share) assistance to land users to address natural resource concerns. NRCS is asking for local input for the fiscal year 2010 program. * Log Cabin, Aug. 11, 1900 - “Samuel Farrow January - Sunday morning, Aug. 5, friends of S.F. January gathered in the Methodist Church to pay to him their last respect. He was our oldest citizen. He was born 1809 in Maysville, Ky. and died in Cynthiana, Aug. 3, 1900. He came to this town in 1821 and for half a century was prominent among our people. He was a fearless leader of the democratic party and spared neither money nor energy to elect its nominees. He never bolted the party’s ticket nor inquired as to what church the nominees belonged. 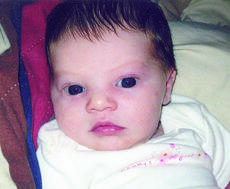 Audree Allen Whitaker was born to Rusty and Stacey Whitaker on Sept. 15, 2009 at Harrison Memorial Hospital. She weighed 8 lbs. 8 oz. 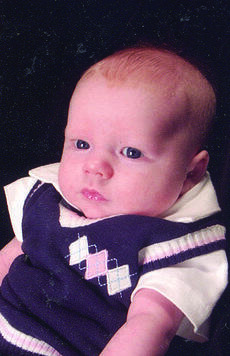 James Carter Palmer was born to Chris and Mary Beth Palmer on Aug. 21, 2009 at Harrison Memorial Hospital. He weighed 6 lbs. 12 oz. I can’t believe it’s almost 2010; another year of gardening and another year for the All America Selections. The AAS have an inherent good gardening stamp of approval. The designation signals superior performance in a plant that usually includes vegetables, annuals and bedding plants. More recently they have added a cool-season award to the list so gardeners can start planting now. Right after I left the tent, I began marking the tree stumps with pink paint. I looked behind every bush and under every rock I saw. I was so scared when I moved a rock and a snake scurried away! I hoped Woody hadn’t encountered any snakes. I called Woody’s name over and over, but he didn’t respond. Continually marking the stumps, I tried to constantly be aware of my surroundings. I spotted a Dogwood tree and smiled. That was my brother’s favorite tree! Maybe I would bring Woody back to see it after we found him. Finally, I heard something. Carter Blaine Jacobs was born to R. Lincoln Jacobs and Kasey Lynn Lawson on Aug. 25, 2009 at Harrison Memorial Hospital. She weighed 7 lbs. 7 oz. 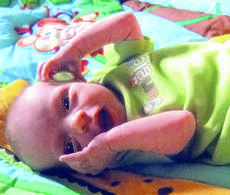 James Logan Anness was born to Jessica Anness of Cynthiana on Aug. 13, 2009 at Saint Joseph East. He weighed 8 lbs. 3 oz. 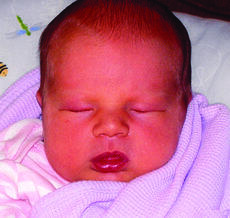 Caydence Marie Canafax was born to Carolann and Jacob Canafax of Cynthiana on Oct. 31, 2009 at Harrison Memorial Hospital. She weighed 6 lbs. 8 oz. Painted Scare Crow Trivet – Thursday, Nov. 12, 9 a.m. to 3 p.m. at the Extension Office. The cost of the class is $20. Deadline is Nov. 5. November Diabetes Awareness Month – Tuesday, Nov. 17, 5:30 p.m. at the Extension Office. Increase Diabetes Awareness – a free dinner will be provided. Call 859-298-4899 to register. 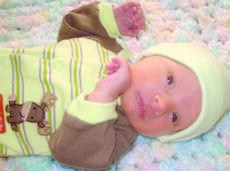 Conner Montgomery Arnold was born to Gene and Nichole Arnold of Cynthiana on Oct. 29, 2009 at St. Joseph East. He weighed 6 lbs. 12 oz. The Governor’s Office of Agricultural Policy announces that American Reinvestment and Recovery Act funds are available to Harrison County farmers on approved energy efficiency cost-share items. Harrison County is one of 49 counties that will not have held or completed a sign-up period for the County Agricultural Investment Program (CAIP) prior to Nov. 15, 2009. Therefore, farmers in Harrison County may apply directly to the Governor’s Office of Agricultural Policy (GOAP) for these energy stimulus incentives.